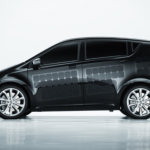 The Sion is the first electric car capable of recharging its batteries from the sun. From now on, you´ll have to worry about range a little less! The Sion copes with the requirements of your daily life: A range of 250km, high power rapid charging, and a sophisticated interior concept with an optional trailer hitch. The Sion is equipped with 330 integrated solar cells, which recharge the battery through the power of the sun. 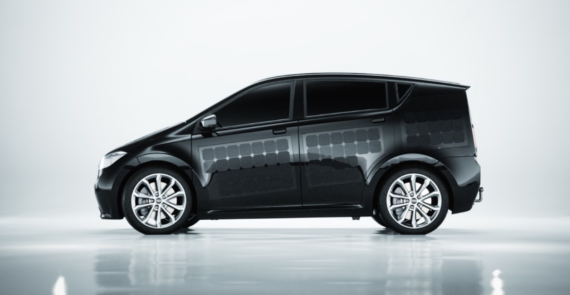 To protect them from harmful environmental influences Sono Motors covered the solar cells with polycarbonate. It is shatterproof, light and particularly weather resistant. Under proper conditions the solar cells generate enough energy, to cover 30 kilometers per day with the Sion. Sono Motors call this system viSono. Thanks to the technology of bidirectional charging the Sion can not only generate but also provide energy. This feature turns the car into a mobile power station. Using a household plug, all common electronic devices with up to 2,7kW can be powered by the Sion. You can plug in your electronic devices and power them with the Sions battery. Over a type 2 plug the Sion can provide even more power with up to 7,6 kW. For air filtering we integrated a special moss into the dashboard. It filters up to twenty percent of the fine dust particles and has a regulating effect on the humidity inside the Sion. No worries, you do not have to water it. It no special care at all. reSono is the maintenance system of the Sion. It enables low maintenance costs due to inexpensive spare parts. With one mouse click you can order most of the car`s components. Sono Motors workshop manual is freely accessible, whether you’re a private person or a car dealer. With the dynamic integration of solar cells in the body work, Sono Motors set new measures on the road while convincing with an exceptional design concept. The full efficiency of the Sion is guaranteed by the lightweight design. The exterior is mainly made up of rust-proof polycarbonate. It further is scratch-resistant. The most unique feature in the body work are the solar cells, which are located on the roof, on both sides as on the hood and the rear. Sono Motors have kept the Sion`s interior very simple. The eyecatchers are the breSono air filter system and the infotainment, with a 10 inch screen. For the cockpit Sono Motors used a very simple design, showing you how fast you are going and the charging level of your battery. On the left side you can see the number of kilometers generated through the viSono System. After 24 hours, these kilometers will be transferred to the right side, where they are added to the total range left. Such a brilliant idea! Can’t wait until other manufacturers catch up.